...my husband waits for his quilt. It's been, oh, at least three years, now. 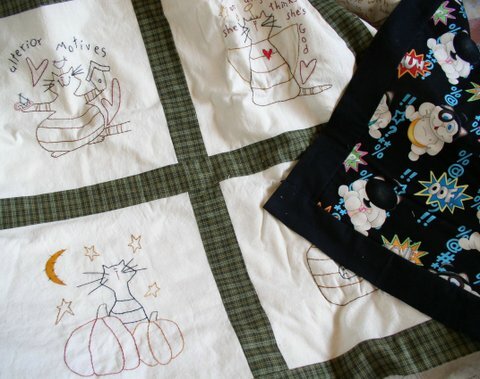 The 12 blocks were hand embroidered onto muslin, and then I just did a simple plaid border. I even got around to basting it ( which obviously needs to be done again!) with thin cotton batting and that fantastic fabric, Sumo Sam from Michael Miller (discontinued now). Doesn't really go with the style of the front, but who cares? I just love that fabric! And it's the back. Anyway. Now I just need to hand quilt it. It keeps getting shelved because it's too hot, too bulky, too impossible to do with the kids climbing over me, and too big of a project for the few hours I have to myself at night. Knitting or handsewing little stuffies seems so much more do-able. But now that I've aired it out, maybe I'll commit to finishing it. Uh, maybe this December for his birthd... no. I'm not going to even say it. sounds like a winter job to me, when it's cold sitting in front of the fire!